83th volume of our periodical Contents of Recently Arrived Journals, which includes the ‘Contents’ of the periodicals in foreign languages that ISAM continuously follows and which is published triannually, has come out. All of the volumes of this periodical, the first volume of which was published in 1994, are available in PDF format. 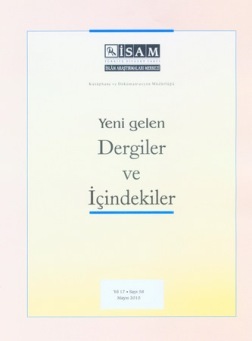 The photocopies of the articles that our researchers are interested in can be sent to their address by cargo if they send an e-mail to kütüphane@isam.org.tr .